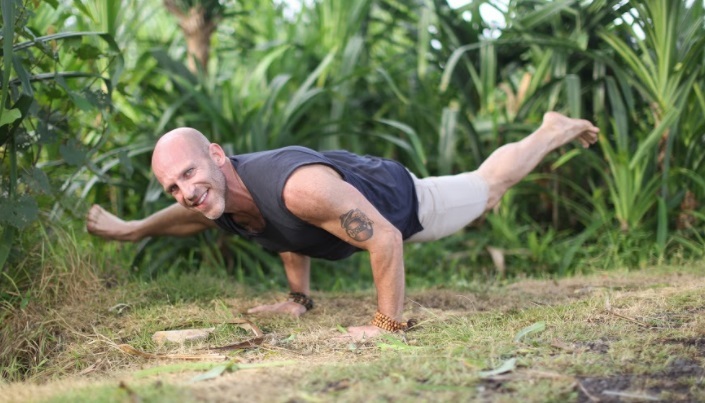 Les Leventhal: International yoga teacher & author, "Two Lifestyles, One Lifetime"
Most think that starts when they roll out their mat. “Not so,” says Les Leventhal. He will skillfully guide you that rolling up the mat is a continuation of the practice. You will awaken to the knowledge that yoga is everything and everywhere. Intentions will be set. Chanting will reveal more intimate connections in daily activities. Awareness of breath will be ignited to initiate a consciousness filled with compassion. Les’ sequencing is safe and made available for all levels of practitioners, whether it is your first day of practicing yoga or your first day of your twentieth year. Everyone will play and dance on their edges. Les’ teachings are founded in ancient wisdom and tethered into modern culture so that what and how we seek can be recognized through the joy and suffering we all experience in the form of attachment in our lives. One of the things I do best is hold space for people to transform their lives. It comes from my own experience of projection, resistance and denial but when I see these things in people, I work on building trust on and off the yoga mat so they can walk through this inevitable change. Staying committed to my own evolution, especially on those tough days that just seem to last a few weeks. Sometimes witnessing people making me uncomfortable and recognizing they are reflecting some part of me is also a challenge for me to be my best but when I see and feel that, I know magic is happening. This benefits everyone, especially my husband. Personal aspirations is easy. Staying patient in our worldwide adventure finding a new home and settling so we can have some dogs again or at least dog sit for folks. I’ve had an amazing life so I don’t really have that many personal aspirations, maybe more business which provides personal, I think. Meaning, continue teaching because it’s my passion and watching people take leaps of faith like we did. Traveling the world for 18 months now, no home, huge aspiration my whole life. It just took 49 years for practicing and developing being responsible and trust to do it. But….my biggest desire to continue to age gracefully in this body. Just one – ok – staying clean and sober, one day at a time, 16-1/2 years now. Getting clean and sober the second time and cleaning up the wreckage of the past. First time, it’s a bit of oh my life and the circumstances and them and this and that and I don’t wish relapse on anyone but my gift of relapse was to see that I was the common denominator and it was all me making the mess, blessing and curse. Anyone who has been down that dark alley or faced any kind of challenge and crawls and drags themselves out of the sewer and sludge and shares about it unapologetically to help save lives. And Caroline Myss. Sitges, Maui, Mendocino, New York City (at Christmas) and Blue Lagoon in Iceland – oh and Bangkok street food. My yoga mat, fresh squeezed juices with ginger and turmeric, airline upgrade please on long-hauls, WE-AR yoga clothing. Yoga, sobriety, drag shows (drag queens are some of those folks that inspire me the most – many have been knocked down and they are fearless and relentless about getting back up to be treated equally), dogs (labradors), love, sunrises and sunsets (on a beach please in Maui with shave ice).